If you haven't heard by now, we here in the south are about to meet Hurricane Isaac. Trust me when I say, that this guy is pain in a lot of people's sides. With the 7th anniversary of Hurricane Katrina tomorrow, people aren't looking to fondly upon this fellow named Isaac. So needless to say, I had to do a little more research while preparing my Hurricane Grocery List. Here are a few ideas that I have come up with. Now some people, like us, have gas appliances. This gives us the ability to cook even though we have no power. Some people don't have this, thus making a few of my ideas difficult unless you have a BBQ pit and are willing to brave the wind and the rain to heat up a few things. 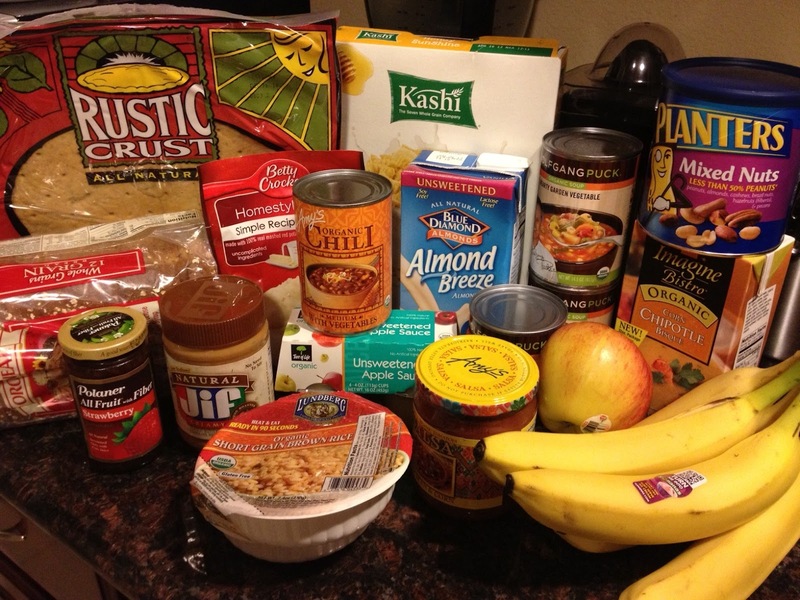 So here goes; my finds at the grocery store. Let me break it down for ya. Cereal is the #1 breakfast idea. But when the fridge has no power, spoiled milk presents a problem. Here is my solution. Almond Milk or Rice Milk make great alternatives. It is recommended to refrigerate after opening, but it is not required. Thus giving you the option of having your favorite breakfast meal. Kashi, a well known health food brand that uses mostly organic ingredients, also has breakfast bars I don't recommend this option, as you may not be getting all the nutrients needed to start your day, but it's still a better option. Soups are a great solution to meal for lunch or dinner. NOw, this is one of those ideas that does require a stove or grill. 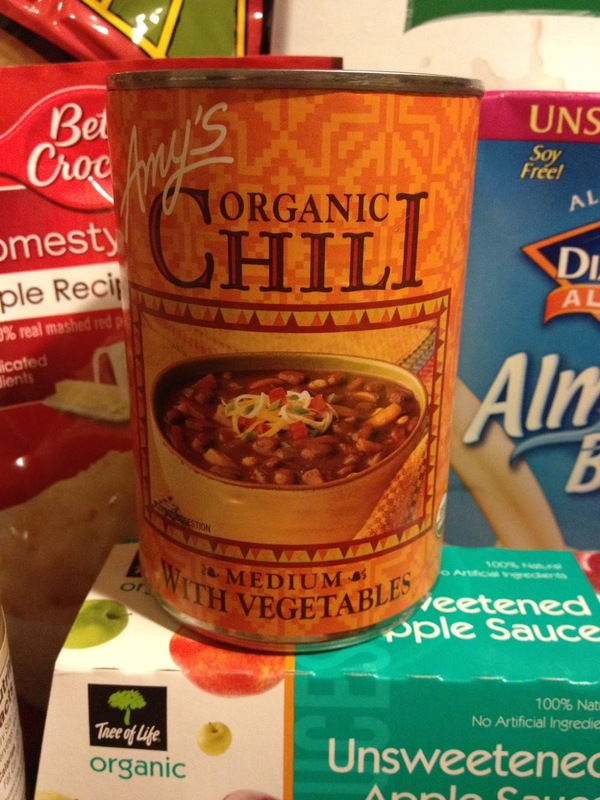 Amy's Organic brand is a great option for organic, less unprocessed soups. My favorite is the Southwest Roasted Vegetable. Another great organic soup is Imagine Bistro. They have a wide variety of flavors to choose from. The kids will love this one and it will keep you full for hours! Homemade Pizza is always a hit, but if you can't use your oven while the power's out, it can make it a little difficult to make it. Here is my solution: Rustic Crust makes organic, gluten free crusts that are already made. Take some organic tomato sauce and your favorite toppings and put it on the BBQ pit. 8-10 minutes and everything will be melted and yummy! Amy's Organic Chili is a great option for dinner. Put it in a sauce pan on the stove and heat it up. I also add Amy's Organic Black Bean and Corn Salsa for added flavor. Fruit, Fruit and more Fruit! Notice how fruit is not kept in the cold section of the produce department? It doesn't have to be in the fridge! We stocked up on bananas, apples, oranges and pears. Mixed Nuts are a great source of fat and protein. Organic, Unsweetened Applesauce is a great hit with kids. Apples are naturally sweet. Why add the sugar? Though I still advocate fresh eating, these options allow you to have a healthy alternative in difficult situations. Storms don't last forever. Thank God! Hopefully this helps give you some ideas next time your in need to prepare for a storm. And if you have any ideas, please share them in the comment section. I would love to hear them!